Southern lit. Family conflict. Race and social issues. Push-pull of tradition. Sense of belonging to place, like it or not. Or at least I hadn’t until earlier this year. 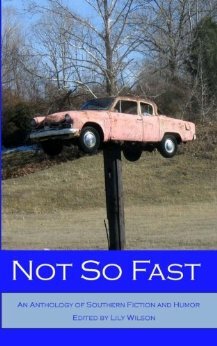 So it’s a thrill that my “Dark Days for the Professor” has been included in NWMG’s Southern lit anthology Not So Fast. So I don’t write Southern–themes generally or voice specifically–but I’m immersed in the South. And oddball humor? I am to oddball humor what cats are to my couch: hairy and all over it. I thought about this one a long while. For me, good Southern lit says something. Stuff gets real. Real real, no magic wind or giant bateau mouche. My first challenge was a real real premise. Funny sure, but recognizably here and now. to show the South at its fault lines, with irresistible change and modernity scraping against long-held traditions. Small towns and county seats in the path of urban sprawl feel the tectonics most. to explore and differentiate between traditions, with some worth protecting (family) and others (racism) that demand rejecting finally and forever. So those are the big words and backdrop. What I really needed was a great character to build a story around. I had the Professor cola idea first–pure inspiration, no shareable logic–and studied up on North Carolina’s Cheerwine. Southern? Check. Local tradition with much history? Check. Adapting and expanding profitably? Check. To jack up story conflict, I went the other direction, a rural-turned-exurban business getting soundly outcompeted. The Professor’s troubles aren’t all fifth-generation Ty Augur’s fault, but his self-indulgence and lack of commitment hasten the reckoning. So next Ty needed a voice. A Southern voice, authentic and not ridicule–redneck jokes aren’t fiction. Usually they’re not even funny. It took me multiple tries to find Ty, and when I did, he became a blast to write. He’s garrulous, the folksy sort you actually encounter down here, and at his wits end. When he calls in his last lifeline, semi-shady and unrooted investment banker Amanda, the Southern-Cool-meets-Gonzo hijinks ensue. Writers have characters they feel blessed to find. Amanda is one of those for me. I envisioned a character at home in a Hunter S. Thompson romp, and out she came, exploding on the page from the get-go. Early drafts had Ty continuing to pitch Amanda while she kicked off a crime spree. It stung a bit toning her down so Ty could have his story back, but the Amanda rampaging through “The Professor” is a stronger and more full character. I struggled most over the story’s racial conflict. Time and again I’d get to where racial injustice invaded, and time and again I’d take a path around it. Even with the obvious message–racism is ignorance and malice that holds the South back–the topic demands sensitivity and weight. But who else are the bad guys holding back Rasping Creek? Not the average good old boy. I know good old boys by the bushel — the operative descriptor is good. And how does the intended theme hold up if racial injustice gets papered over? So I stopped resisting it. How well I dealt with lingering silent and not-so-silent hate? That is up to the reader. I won’t say fictional Rasping Creek isn’t rife with comedic liberties–it is–or that the hijinks aren’t over the top–they are–but “The Professor” makes for a fun ride with some depth. That was the plan, anyway. I want to thank Lily Wilson for her hard work on–and faith in–the Professor. A terrific editorial eye, she has, and she deserves credit for putting out this labor of love. Check out the anthology at Amazon paperback, Kindle, or CreateSpace. Sure, I’m not objective, but I’m still a fan of good writing. A few bucks bought me a terrific Southern read and a heap of laughs.